ENA’s Sierra Leone staff supplied clean water to the village of Mukeketa in the Nyangana region of Namibia. Not only will this community have clean water for the first time, but, they will now be safe. Every year unsuspecting children and villagers from Mukeketa are killed by crocodiles while fetching water from the Kavango River. 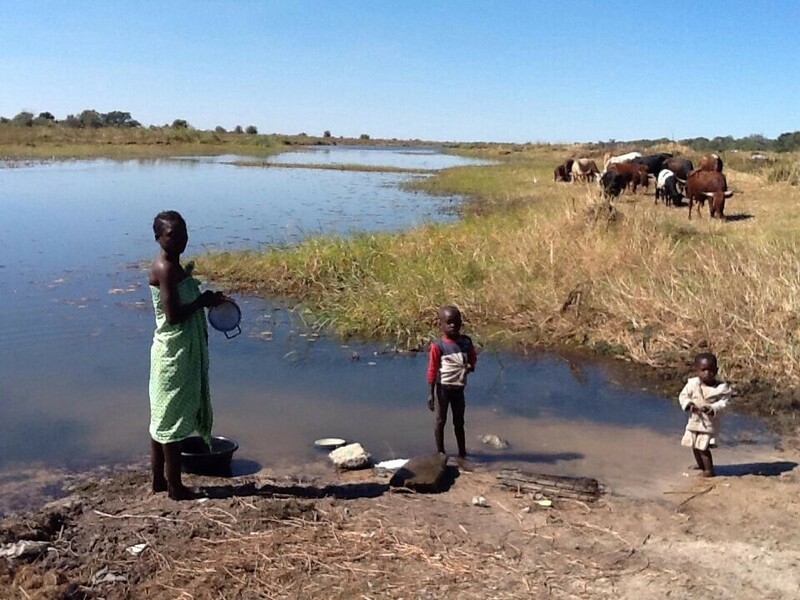 Children fetching water from the dangerous and dirty Kavango River. Prior to the pipes being laid, women and children would walk 4 kilometers (2.48 miles) each way to the crocodile-ridden Kavango River to fetch dirty, unsafe water. Furthermore, their daily trek to collect water was impossible to complete before the school bell rang so the children in Mukeketa were falling behind in their schoolwork. A mother walks from the Kavango River where she fetched water and washed her family’s clothes while carrying her baby on her back. To bring the village water, ENA staff and community members calculated the amount of pipe needed and dug trenches from the clean water source directly to the community center. Reinforcing ENA’s model of community participation, men and women worked together to dig the trench that would house the water pipe. It was demanding physical labor, but they willingly and excitedly worked alongside one another knowing the end result would be clean water for their families. After the trenches were complete, Richard Matanda, ENA Director of Africa Operations, delivered the water pipes to be installed. Once the pipe had been installed, community members worked together to join all of the pipes together and check for leaks. Clean water can now be collected from a faucet in the community center. Clean water changes lives. This village can now look forward to a myriad of benefits including a decrease in disease and water-borne illnesses. The children can be on time to school and catch up on their schoolwork. Women and children will no longer have to walk long distances each day to fetch water and live in fear of being killed by a crocodile along the way. We know that water is life and with your continued support, we can change lives in more villages just like Mukeketa. Visit us here to donate today.